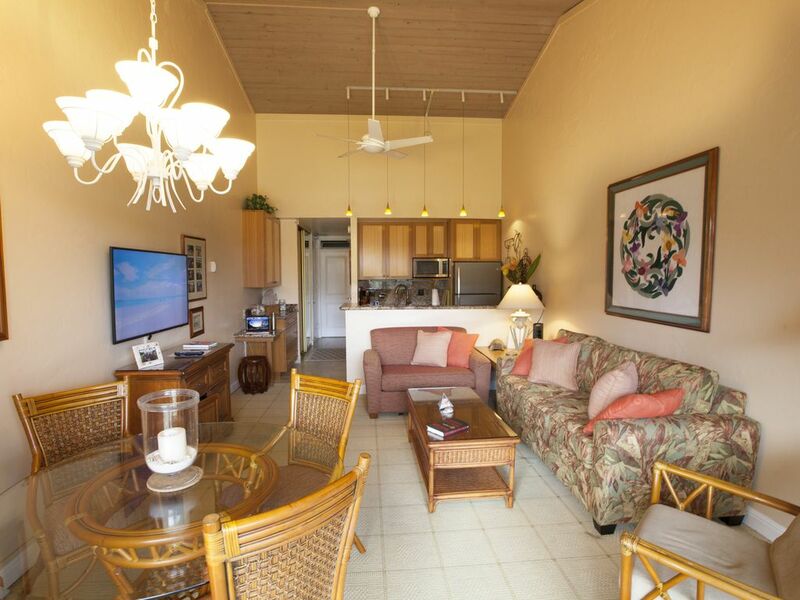 Napili Shores Resort - 1 Bedroom Remodeled & Gorgeous! We love the lushness of the property, how close it is to Napili Beach (it's about 140 steps from your front door), no high rise apartments nearby and the friendliness of the staff. It's relaxing to sit on our lanai and look out toward the ocean and Mo'lokai. The sunsets are beautiful! Love having two restaurants on property, especially, The Gazebo. The macadamia nut pancakes are great! The resort itself is nicely situated when it comes to shopping, restaurants, exploring and watching the whales from the 'wall' next to the Gazebo. Both of our units have been completed remodeled. They don't feel like you are staying in a hotel suite, but a home. When we travel, we like being able to walk into our accommodations and be greeted by warmth and comfort, not a generic property that feels like every other one that you typically get when you rent from a resort. A majority of our guests are repeat guests, give us a try, I think you'll like what we have to offer! Aloha! iPod/iPhone Docking Station/Stereo, 2 Restaurants, Laundry facilities on site, Ceiling fans, Coffee maker, Ironing board & Iron, Hair Dryer, both units are strictly NON SMOKING UNITS. Before you "Book It Now" and/or want to send a deposit, please contact me first. I try to book reservations back-to-back where guests arrive in the afternoon of the morning other guests depart. If a guest chooses dates that are not back-to-back, then I like to leave seven nights in between bookings, as this is the most request length of stay requested. Please send an email to me with any questions before booking as it will be necessary to confirm that the dates you desire work well with my calendar. I have a variable deposit schedule based on the rate at the time of booking. I will let you know in writing what deposit is required and what and when the balance is due. Daily base rate for 2019 start at $225 and go to $265 USD plus tax and $250 security deposit. All rates quoted depend on unit selected and payment made by cash/check. Payment made via credit cards will be higher. Do not rely on the automated quotable rate, only the amount I send directly to you. Six month Christmas cancellation policy applies. All rates subject to 14.417% tax. There is an additional $150 cleaning fee, plus tax. There is a $75 registration fee (2019) paid separately to the front desk upon arrival to the resort. $250 security deposit required. Tax ID #W30281982-01 Payment is accepted in the quoted currency (USD$) unless the currency and the amount is specifically agreed in advance with the manager / advertiser. Note: Until confirmed, rates are subject to change without notice.